Hey, New York and the area around - What do you think about the state of the public washrooms in the schools, restaurants and gas stations in and around New York City? Here's relief! Tired of walking into a restaurant or gas station and asking to use the facilities only to find them fifthly. Well here is a chance to report the best in the area. 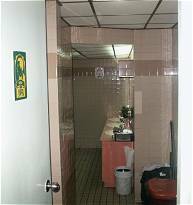 tdc's Washroom Assessment provides you with a forum on where to find the cleanest in and around the New York City Area. Sorry, but if we were to post the filthiest and most disgusting we might be open to legal proceedings. They had better do a better job with your washrooms! We live in the UK are coming to NY City in February 2003. As we have 3 children, I'm trying to find the location of all clean public toilets...there's always one of them wanting it! I visited NY last year with some girlfriends and we had great difficulty finding decent toilets or a place that would allow us just to have a coffee at lunchtime. We had to use Starbucks but the toilets were always a disgrace! I would really appreciate if you have any knowledge of suitable washrooms that our children will be able to use! We will be doing all the Tourist attractions etc! The ratings are presented on this site are updated as they are received in order to present you the most up to date ratings as possible. Your submission is not automatically put on this page but if accepted will appear within 24 hours of your submission.